We all have them. I can’t think of a single women or man for that matter that hasn’t experienced a fat day. What is a fat day? It’s a day where no matter what really might be going on, we’re convinced we look fat or feel fat. Its often concurrent with a bad hair day, a profound lethargy or just a day filled with a ton of negative thought-bubbles swirling around us relentlessly. What is a natural fluctuation in weight or fluid be it because of salt, menstruation, water retention, hormones or other factors, becomes something cataclysmic in our fat-phobic centered minds. This is not a personal failure but a societal one. Our collective societal psyche has been taught that having fat on our bodies, eating fat or being fat is the worst possible thing that could ever happen to us and that if we are having a “fat” day that it means something is wrong with us. It may even signal to us subconsciously that unless we take immediate, extreme action to deal with this perceived “crisis” we just won’t get the love, admiration, success and adulation that we so desperately crave. The problem here is obvious yet we’re so in the throes of dieting culture on a day-to-day basis that it’s hard to see it or make sense of it. Remember that our “truth” is born out of the subjective meaning we create based on our perceptions. Our perceptions give birth to thoughts, which give birth to beliefs. We try to make sense out of all of these. As children and young adults we turn outwards, looking to peers, parents and media to shape those beliefs and values. We look for evidence that will concur with the meaning we have built out of these thoughts and beliefs and these are manifested in our behaviors in everyday life. Thus, when we experience a “fat” day, we grow fearful because of the “truths” that we have extracted from what that actually means in terms of how we feel and what we look like that day. No one else may even have the slightest inkling of how you’re feeling or any change in your appearance that day but we walk along as if we’re wearing the scarlet letter. I know this because I too have looked incredulously at people who have complimented me on a fat day. “How could they possibly not see that I have, in fact, gained 15 pounds overnight! It’s so obvious!” Or is it? Maybe it’s just not true. I had a client once give up weighing herself for a month as an experiment. Without the constant validation and reassurance from the scale, she was certain that she was on an extreme weight gain trajectory no matter any evidence I gave her to the contrary. In addition, she talked about a party she went to where she indulged in 2 cookies. In that instant, that very instant, she described feeling heavier and convinced herself she had gained weight. Part of her faulty beliefs was that cookies = automatic weight gain. That had been her belief for so long, it was hard for her to imagine actually eating couple cookies without the consequence of weight gain. When she finally weighed herself, she was actually down 2 pounds and was shocked. But, this is how we chipped away at old beliefs that were no longer serving her. 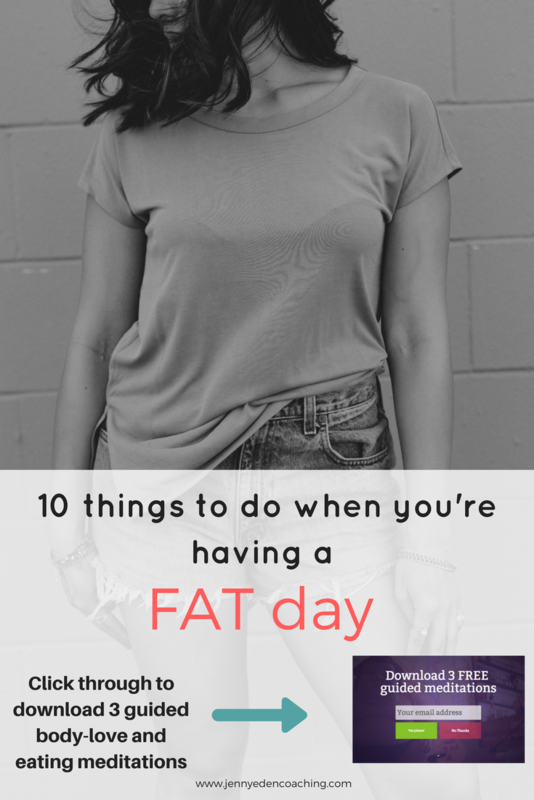 So, what should you do when you’re having a “fat” day? Try these techniques below. 1. Take a few deep breaths. Negative self-talk and constant worry about weight and our appearance can put us in a low-level stress response. Work towards calming your nervous system down. Try this: 4 counts on the in-breath, 7 seconds of holding the breath and 8 counts on the out-breath. Do this 4 times to get into a parasympathetic response. 2. Stop and evaluate reality – Could you be getting your period? Did you have a salty meal last night? Are you holding on to fluid because of a big workout? 3. Question your perceptions, thoughts and beliefs. Bring inquiry to what is actually going on for you in that moment. 4. Isolate the emotion – What is the underlying and deep desires or fears that come with experiencing a fat day. Isolate and write down what that emotion or those emotions are. 5. Do something loving and nourishing for yourself. Take a bath, use essential oils, take a yoga class and drink some lemon water to give yourself care and consideration during a time that usually is associated with anger, fear, worry or confusion. 6. Don’t take the current reality and twist it into a “this is what will happen” scenario. Try to bring mindfulness to the moment and even give yourself permission to stop and truly feel and experience the discomfort you’re feeling emotionally and physically, rather than push it away or numb out to it or to predict the future. 7. Be aware of self-sabotage! I’ve been in this scenario and I know you have too. You feel fat, thus you feel hopeless and frustrated, so you say something to yourself like “See, I’ll always be fat anyway so I might as well just eat what I want right now.” which actually perpetuates the feelings of stuckness that you are experiencing. If you notice yourself doing this, go back to #5 and pick something to try. 8. Wear forgiving and comfortable clothing. Don’t try to fit into something that just doesn’t’t fit that day! Give yourself permission to wear the yoga pants and bulky sweatshirt today and relish in that comfort. 9. Join us in the Wellness Warriors FB tribe and send out an SOS. I’m willing to bet you’ll find many that resonate with how you feel that day and will have wisdom for you if not merely commiseration. 10. If the intense negative feelings continue – consider seeking professional help around body image and empowered eating. That’s me! Book a free session here. BONUS: Download 3 guided eating and body-wisdom meditations completely for FREE. Click this link to access them immediately! Over to you. Tell me how you feel when you have a fat day. Do these ideas resonate with you? Any ideas you would add? Remember, my goal in this post is not to assume the goal is to lose weight or rid yourselves of the fat feeling but more to bring compassion to your body, when it feels uncomfortable and to work on mindset shifts and inquiry which ultimately could make you happier and more peaceful long term than what weight loss could provide. I also do not begrudge anyone for wanting to lose weight, if that desire is coming from your own voice and no one else’s and if it’s done in a gentle, kind and moderate way. yes, I know these days! I have so many food allergies that I feel like that all the time its so annoying! Thank you for sharing!!!! !